Multan was ruled by various Hindu and Buddhist empires for over 1000 years. It was the capital of ancient Trigarta Kingdom at the time of Mahabharata and ruled by Katoch Clan Kshatriya Rajputs. It is believed to have been visited by Alexander the Great. It is said that when Alexander was fighting for the city, a poisoned arrow struck him, making him ill and eventually leading to his death. The exact place where Alexander was hit by the arrow can be seen in the old city premises. It is believed to be the same city as "Maii-us-than", where Alexander's forces stormed the citadel after seeing their king injured and unconscious on the field of battle. Multan was part of the Mauryan and the Gupta empires that ruled much of northern India. The princely state of Bahawalpur was founded in 1802 by Nawab Mohammad Bahawal Khan II after the break-up of the Durrani Empire. The Bahawalpur State was one of the largest states of India. Cholistan the biggest desert in Pakistan is locally known as Rohi. This famous desert is 30 Km from Bahawalpur and comprises of an area of 16,000 sq.km. Which extends up to the Thar desert extending over to Sindh? 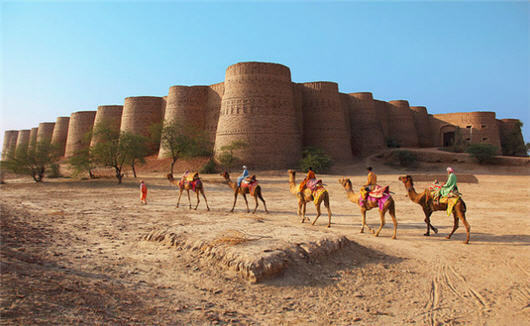 The word Cholistan is derived from ‘Cholna’, which means moving. The people of Cholistan lead a semi-nomadic life, moving from one place to another in search of water and fodder for their animals. DERAWAR FORT: Derawar Fort is located 48 Km from Dera Nawab Sahib. It is still in a good condition. The rampart walls are intact and still guarded by the personal guards of the Amir of Bahawalpur. 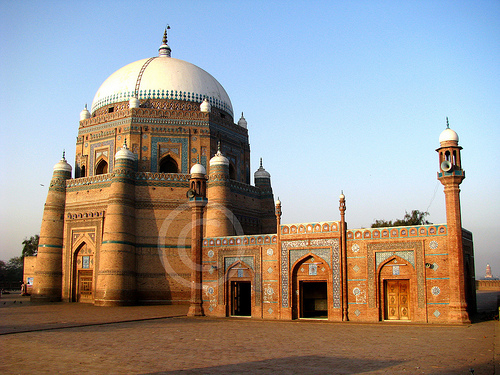 The tombs of the ex-rulers of Bahawalpur and their families are located in this fort. The fort was built in 1733 with decoratively carved sandstone walls, which take your breath away, as they rise magnificently from the flat desert wasteland like something so grand it is difficult to imagine. It is extremely photogenic, but is best seen in the morning or evening before or after the desert's midday sun takes hold.